More than 100 students, faculty, staff and community members attended the third transit forum presented by Vanderbilt this semester. 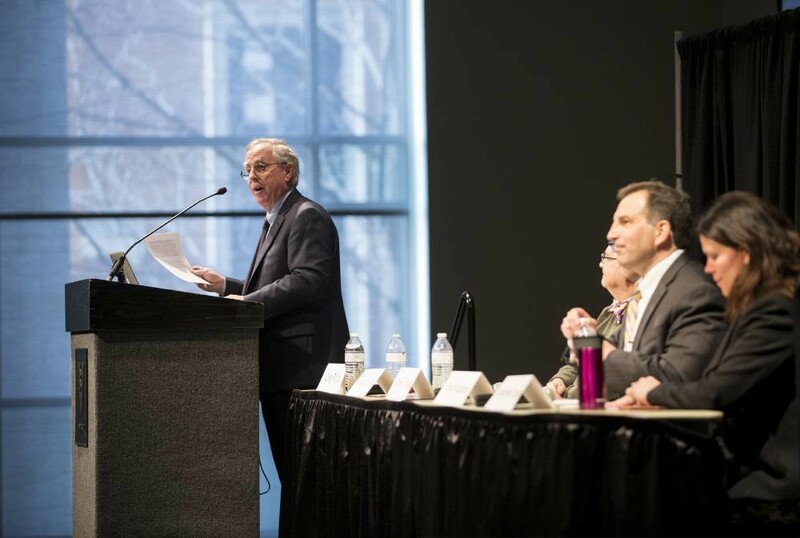 The March 13 event featured Eric Kopstain, vice chancellor for administration; Macolm Getz, associate professor of economics; and other experts who provided insights about Nashville’s proposed transit plan. The event, titled “Additional Perspectives of the Nashville Transit Plan” was hosted by Vanderbilt’s Office of Community, Neighborhood and Government Relations in the Division of Public Affairs and the Vanderbilt Center for Transportation and Operational Resiliency (VECTOR). Craig Philip, research professor of civil and environmental engineering and director of VECTOR, served as facilitator. The panel also included James Fraser, associate professor of human and organizational development, and Jennifer Carlat, vice president of metropolitan policy for the Nashville Area Chamber of Commerce. The next forum in the series is slated for 11:30 a.m.–1 p.m. April 17 at the Student Life Center.